These might be creepy if they weren't so tasty! 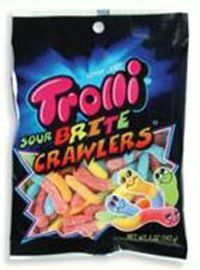 Trolli Sour Brite Crawlers just might be the most popular sour gummy worms on the market, and there's good reason for that. They're the perfect size for kids' and adults' hands, bring the ideal balance of sourness and fruity flavor, have a satisfying 'chew' that is neither too soft nor too hard, and... well... they're so captivatingly colorful! They are just so awesome!! !